This week it's Vintage Vehicles, be it cars, buses, planes, boats, ships or anything that travels through the air, on the sea or on the land. For this competition, vintage will mean anything manufactured before 1970, so vehicles up the the 1960s are included. Many thanks to all who entered. This looks like a challenging set of excellent images, so let's get down to it! Perspicador – Wessex – Amazing machines, and difficult subjects for photography. The underneath view is also challenging in that there's not much to be seen of the helicopter, but most of all it's the rotor vanes that need to be watched. It's important to have good movement to show that the craft will not just fall out of the sky, so a longer shutter speed than used here could have been helpful. JAK – Walsall Corporation Trolleybus 862 – When I was very small I actually travelled on a trolleybus that was still in service. Totally pollution free and just a whirring electric motor. Moving to diesel buses may have improved versatility with the routes, but I'm pretty sure it was a backward step in many ways. A really interesting and highly competent shot of a fine vintage bus. Nigelk – HMS Warrior – Another fine shot, showing a definitely vintage style of ship in the context of its modern surroundings. Perhaps the lighting could be a bit more dramatic, so if possible a reshoot on a really good day would be great. The light here is a bit flat and uninspiring, but the actual content of the image is fascinating. walkeja – Corvair – Very nice, I want one. A terrific shot of a superb car. The only thing that could make it better is a different location, something to complement the classic lines of the vehicle. However, it was here, you saw it and made an excellent record of it. Johnwnjnr - atmosphere - I like this for its human interest, something is clearly happening and the image tells us the story. The steam just shows that it does add atmosphere. It might not the be the most climate friendly method of propulsion, but it has a lot of raw energy (no pun intended) and makes a great photograph. johnjm – Scenic Railway – This image does pose a few questions. I love the intense colour and all the detail, but don't see where the scenic railway bit comes into it. So it could be that the image has concentrated too closely on the detail and isn't giving us the context, the story of what it is about and how it relates to everything around it. I would like to know more. EricD1306 – AEC Regent – The front view gives us quite a bit of information about this fine old bus, but I think I would have liked to see a bit more of a three quarter view, so that we can see more of it. The lighting is a little dull again, admittedly not something the photographer can control. The bus is there, we are there, and those circumstances may not arise again, so whatever the light we make the best of it. Upping the contrast may help to give it just a tad more pizazz. mcrtchley – Himalayan Land Rover – There's more light here and it does lift the image. probably the same applies as to the last shot in that more of a three quarter view could give us a bit more information. If indeed it is possible to move around to a different viewpoint. But another really interesting image with lots of appeal. HazyJ – Bentley Mk VI Special, 1946 – This has lots of action, and also gives us that three quarter view that reveals so much more visual information. The wheels can be seen to be rotating, the splash of water on the road shows us there is action and movement and the look of the driver is intense. The conditions take the edge off sharpness, but it doesn't matter because it's showing us something real and something with atmosphere. don1548 – Vintage Vehicle Contest – The car is great and hits the spot in terms of subject matter. The unfortunate thing is of course the vast over exposure of the background, which is so bright compared to the main area of interest. In some way we need to either light the car with artificial light that balances the background, or move around so the light is falling on it. As it stands that background is so competitive for our attention that it does overwhelm the foreground where the interest really lies. davidwoshere – 1955 Scamell Tractor – Lovely colour, sharp and crisp detail and the best viewpoint available to show us the subject clearly. Again, only better surroundings could improve on this, but that's not something that we can summon to order. noelm – Duchess of Sutherland – A classic monochrome image of a classic train, all totally appropriate and well put together. I would personally up the contrast slightly, but that's a judgement call for the individual photographer and it is just fine as it is. tyronet2000 – Rover 90 – There are not many detail shots in this competition, so a different approach that has yielded an interesting shot. I do feel that it could be slightly crisper, so if this wasn't shot using a tripod then perhaps a good idea to do so. Then a smaller aperture can cover the depth of field and yield that crispness that makes a fine record shot. Noelcmn – 1937 Chevy – We could debate the good taste of otherwise of the colour scheme, but perhaps not....A very striking car, actually quite suiting this front on view because the shapes are powerful enough to carry it off. The driver looks huge compared to the size of the car, but that is quite commonly seen with older vehicles. Compared to what we have now, they can look really tiny. An attractive image. retsoor – Steam Tug – Bold colours and great light make this image. It's bold and brash and works. stephen-s – The Mighty MG Midget – Midget indeed, and the driver looks pretty cramped, but enjoying every minute of it. Action and movement clinch the shot. So, time for the winners! First Place goes to HazyJ for a picture full of action. Second Place to JAK for the brilliant vintage Trolley Bus. Third place to noelm for the classic black and white shot of a fine engine. retsoor, davidwozhere, mcrtchly and johnwnjnr – all of whom have entered fine images, but sadly not all can make it to the top three. Hope you enjoyed the competition, it was great to see all your images and I hope the comments I've made have been helpful. Now it's over the HazyJ for our next challenge! Congratulations to the winner and other places and thanks to johnriley for the interesting subject the judging and the comprehensive comments. Thanks for the 3rd place and congratulations to the other podium places and HC's. The winner was a cracker of a shot. A good competition with a wide range of interpretations. As usual excellent comments from our judge. Thanks for the placing on the podium and well done to HazyJ, noelm plus the HCs too. Thanks also to John for the competition, judging and comments. Congratulations to the winners and HCs. Thank you John for the competition and judging. If I ever get back to Portsmouth I'll be sure to book better weather. Thanks John for judging my image the best. Congratulations also to JAK and Noelm and all the other contestents for taking part. 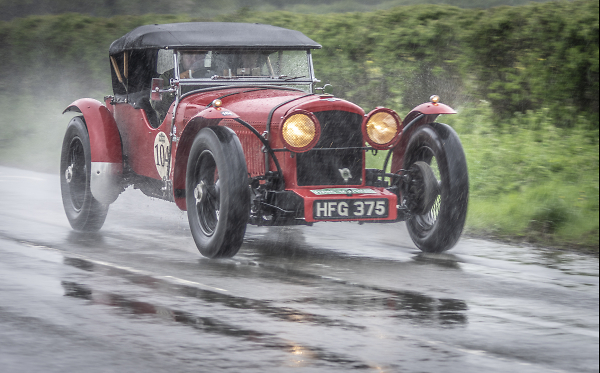 It is interesting that my Bentley image was taken during the same event as that of the MG, only mine was last year when it was teemig with rain. I was very grateful of good waterproofs and the weather sealing of my K3 and Pentax 55-30mm WR. For next week, I have set the challenge to photogrph something blue. Let the imagination run riot. I agree, that is a cracker of a shot, worthy winner. Congrats Hazyj. And extended to JAK and noelm and not forgetting the HC's retsoor, davidwozhere, mcrtchly and johnwnjnr. I certainly enjoyed this challenge, nice dose of nostalgia. Thanks to our Judge for the Challenge, C&C's-always appreciated. Thanks for the comment, I was in Antibes and saw this, but couls not get a better view due to its location.